Many people tend to be comfortable with people their own age. And many places in Seoul can be categorized by age for various reasons. If you want to make Korean friends that are around your own age, here’s the post for you! Hongdae is the name of one of Korea’s most prestigious art universities (Hongik), and its surrounding area is famous for being the subculture mecca of Seoul. Here you’ll see underground rappers, indie rockers, struggling artists and people with pink hair. And in Korea, most of the people on the fringes of society are usually the youngest. Korea has a very strong mainstream mindset and culture. And to break away from that, most people need youth to fuel their bravery/rebellion. 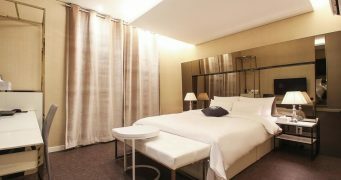 Couple that with the other large universities nearby (Sinchon, Ehwa), and you’ve got yourself a youthful college hangout. Note: Some bars/clubs even have maximum age limits (usually 30). Also, the Sinchon and Ehwa areas nearby are other popular college towns. How to get there: Hongdae University Station, Line 2 or Sansu Station, Line 6. Geondae University is essentially the same as Hongdae without all the art and culture and with more drinking. We’re talking about heavy drinking. And the best time to get plastered with your buddies and to meet new people in the process is college. 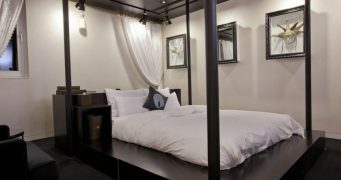 While Hongdae will still attract older visitors interested in street culture, Geondae is more exclusive when it comes to age. Walk down Geondae’s Rodeo street, and you’ll find a bar, a cheap all you can eat Korean BBQ restaurant, another bar, a booking club, and a chicken and beer place. It’s gritty and cheap, but more importantly, young, wild and fun! 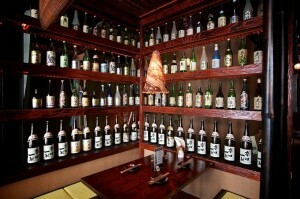 Read this post on Korean hangover cures to prepare yourself. Itaewon has been Seoul’s foreigner district for the last few decades. It has a long, rich history of foreigners of all ages. And that means delicious and authentic foreign foods and distinctly non-Korean bars and clubs with non-Korean clientele. But the last few years, local Koreans have started to hang out in the area for the good food, the trendy restaurants, and the new and non-sleazy lounges (although there’s still plenty of those if that’s your thing). 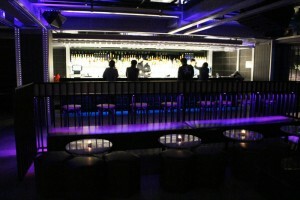 It’s also a great place for singles to meet each other, as it’s probably one of the very few areas in Seoul where meeting people at cocktail bars is a totally normal and common thing. 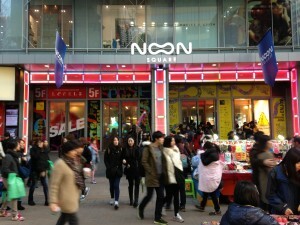 And since it’s the most non-Korean place in Korea, age is not as important here; people of all ages hang out in the area. But for Koreans looking for trendy lounges and chic restaurants in Seoul, they’ll most likely be in their mid 20’s to early 30’s. It’s the perfect age range that combines earning power and freedom. For all ages, Itaewon is very welcoming. But some places can be too expensive for college students and not classy enough for some business professionals. Gangnam Style is all about flashy cars, fancy shades, brand name bags and horse dances. But Gangnam is actually a very big area that includes close to half the city of Seoul. The song should have been called Cheongdam style. Cheongdam is where all the expensive sushi restaurants, Gucci shopping and Ferraris are located. And of course, that means people with money. There are some younger people in the area, but they’re mostly coming from wealthy families that own multi-million dollar Bibimbap restaurant chains. The majority of Cheongdam is packed with hot shot Koreans with successful careers and money to spare. And that can mean a few years of hard work for them to play hard (read late 20’s to late 30’s). We’re talking about hanging out on a regular basis. Age doesn’t mean a thing if you got the cash, even if it’s just to splurge on a fancy dinner for your birthday. Don’t worry if you’re not in your late 20’s to late 30’s or not even that wealthy. There’s still plenty of inexpensive places for commoners, too :). It’s a large area with many places, but one of the most popular places is Garosugil. 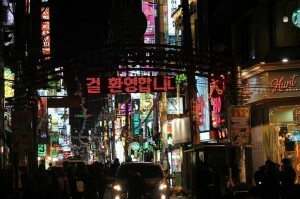 Before Gangnam was Gangnam, Myeongdong was the hottest spot in town. And some of the oldest restaurants in Seoul have a loyal customer base that have been going to the same restaurants for decades. It’s still a popular place to hang out in Seoul for old timers meeting up with their buddies for some food and drinks. But Myeongdong is home to many of Korea’s office buildings. And during lunch hours you’ll see tons of Korean salarymen and women waiting in line at popular lunch restaurants. 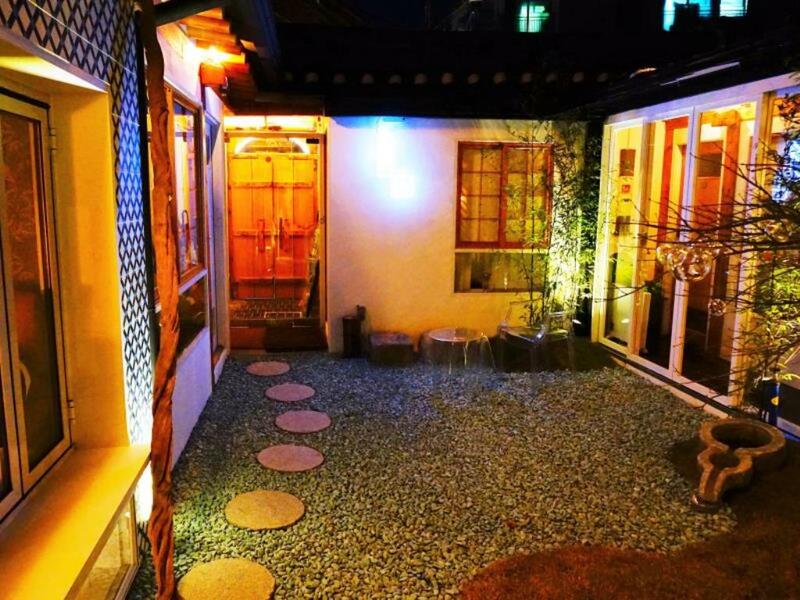 You can also see them at night kicking back a few bottles of soju after work hours. On weekends, Myeongdong and its surrounding areas turn into popular date places for many couples looking to get out of their usual hang out spots. And after school hours, you’ll see uniform wearing teens that just want to give out free hugs and take sticker pictures. You won’t feel out of place, no matter your age :). 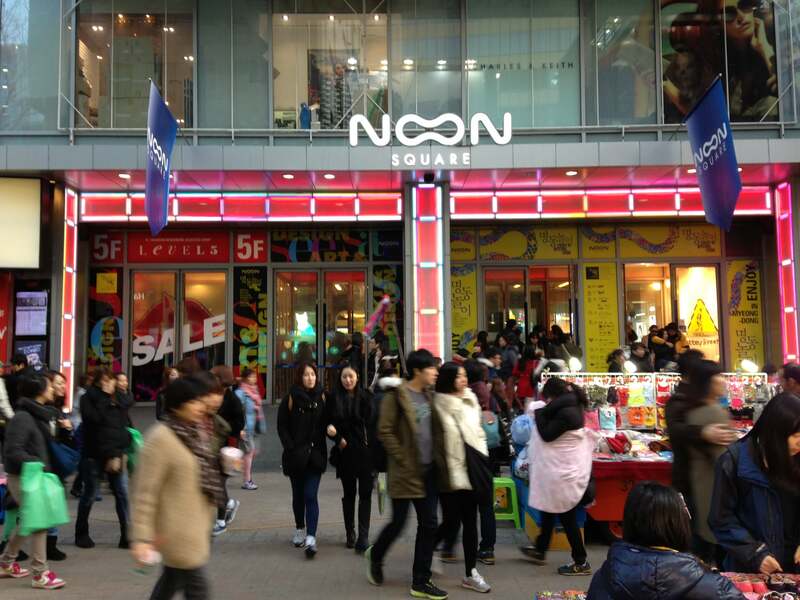 Myeongdong is also one of the best places to shop in Seoul! Here’s a few Korean brands you’ll find in Myeongdong. Of course these areas are not age exclusive. They just happen to have more of a certain age group for various reasons. Which place would you like to hang out in the most? Leave a comment! 내 블로그가 왜 이 글에 링크되어있는 겁니까. If you don’t want your blog to be read why do you have it online? I think Mr. Cockroach means that Keith posted a link to his page on roach’s blog to get hits. He insinuated he would like the link removed. Yo, ‘Wheel Philosopher’ – do you know how to read English? And Keith – where do mid-60s old Korea Peace Corps volunteer types hang out? why bad? bad is the writter. & i’m not wheel. i’m roach. This article is just what I needed!! I’m visiting Seoul next week and was wondering where should I hangout to meet a “Seoul mate”.. Lol.. Thanks!! I’m reading this from Brunei! hello jessica hope you are well, iam also visiting Seoul in first week of august, would you like to be my friend ? What about over 30? Like 50s? What about not quite 40s but not 20-30s either? I saw the word “booking club”, EatYourKimichi (simon & martina) also mention it before, but what does it mean? I only understand that it’s like a pub place. Where is the best place to hang out where you can meet some of the k-pop idols or celebrities? do you love PS4 already? For those asking, I always see people 30-50ish in Haebangchon. More pubs, less clubs. That’s a great help. I will be in Seoul and Busan in March and I really wanna go to a club with people around my age (30+). Any recommandation? I was in Korea 3 weeks ago for 8 days with my girlfriend. We stayed in a city well located to move around the main cities near Seoul. One night, after the 2nd day of Ultra Korea (EMD huge festival), we decided to have a club-scene nightlife experience and had heard of Itaewon where it suits nice mostly for foreigners. My surprise was that the 1st club we tried to get in, the bouncer asked me for ID, showed my passport and I was turned away due to my age (41 now). Never ever had this kind of experience before in other parts of the world I’ve been to. I read somewhere about age limits when it comes to clubbing in Korea, but knowing that Itwawon is more likely that foreigners are accepted than other parts in Seoul was totally unexpectable.